8 months & 26 Days. 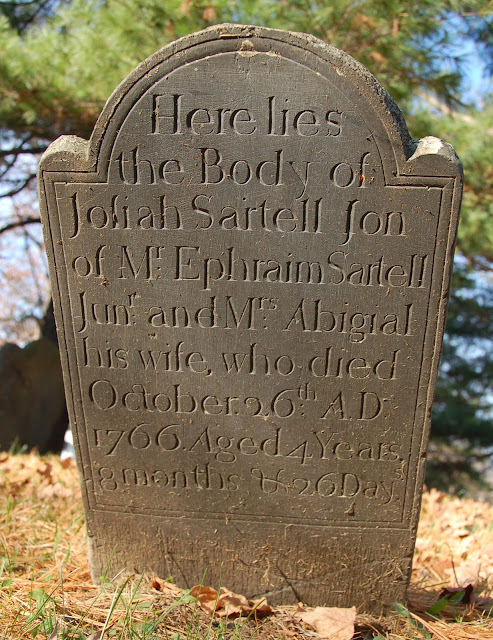 The Sartells of Groton (more often spelled Sawtell) are all descendants of Richard of Watertown, who was born in Aller, Somerset; he immigrated by 1636. Richard and his wife Elizabeth had 11 children born in Watertown, and then Richard became one of the original proprietors of the frontier settlement of Groton. He lived there in the 1660s and 70s, but evacuated the town with all the other inhabitants after it was burned in King Philip's War. He lived the rest of his life in Watertown, but many of his children returned to Groton, where the name has been common for 350 years.